Large Format Posters is rated 5.0 out of 5 by 4. Let customers know you’re in business, even from a distance. Rated 5 out of 5 by Posters from Nice material Really love these posters. Material seems to last. Rated 5 out of 5 by Blackjack21 from Excellent!!! Printplace Rocks!!! You guys are the very best!!!!!! Rated 5 out of 5 by Pdiddy from Great job Loved it it was a great value and a great product. Large format posters do more than bring your brand to an incredible scale. Use large prints to show off your company’s portfolio. Get consumers to notice your booth at a trade show. Whether at a big event or in the comfort of your store, large format poster printing offers all kinds of marketing possibilities. Our high-resolution printing takes your design a notch higher with bright and durable paper. You’re also free to choose from several standout sizes. We offer a wide range of standard poster sizes that start at 11” x 17” and can be as big as 27” x 40”. 24" x 36" is the most popular among the largest sizes and is commonly seen in trade shows, conventions, and high traffic areas such as malls. 18" x 24" or the medium size is recommended for visual or graphics heavy custom posters. 16"x 20” is among the smaller sizes normally used on photos or artworks displayed in stores or indoor areas. The size of your large prints capture one’s attention but it is the poster’s print quality that piques their interest. We print every poster on materials that showcase the design’s incredible detail. Print large format posters with us today and receive your order on the next business day. Get in touch with our print experts to help you get started. Is there a minimum quantity required for me to print large format posters? You are free to order 1 or up to 50 large format posters. As long as the number falls within our choices, we will produce the indicated quantity. Which material should I use for an outdoor event? We recommend printing the design on 20 mil. styrene, which is usually displayed outdoors. It’s also waterproof and lightweight enough to roll for storage. When can I expect my order of large format posters? Large format posters can be ready after 1 business day. The turnaround time is how long it takes to produce your order. The order will be mailed after your preferred turnaround time. To know more, read our detailed explanation of our turnaround options. 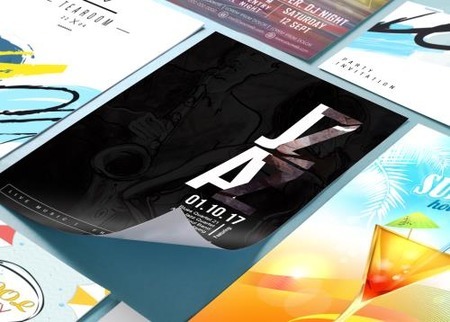 Make sure your artwork meets our printing requirements with these large format poster layout templates. Free downloadable layout templates are provided in several formats for front and back sides. You need to keep in mind several design and marketing practices when it comes to posters. These help make a good impression on your brand. Get straight to the point. Only give out the most essential information. Organize the lines such that the important details are easy to find. Use fonts that are easy to read. Keep things cohesive. No detail is spared in large posters. Make sure the logo, colors, typography, and copy follow the same brand guidelines. They also all need to work toward the same goal. All elements must be in high-resolution to ensure clear large format poster printing. Place your posters in strategic locations. Is your store located in a high-traffic area? Do you want customers to see the latest discount from behind your window? Or do you want instant recognition from a farther area like the mall entrance? Observe your location and see which places your customers and target market frequent.